Cut a large piece of muslin, the size of a tea towel – or just use a clean tea towel. You will also need some string to tie up the muslin and somewhere to hang the muslin over a bowl. Spoon the yoghurt into the middle of the muslin, gather up the muslin, tie it tightly with string and hang it over a bowl to catch the whey. Leave for 8 hours. Untie the muslin and scoop out the strained yoghurt into a bowl. Either discard the whey or you can cook with it, using the whey to add to curries instead of water. Soak the saffron in the hot milk for one hour. 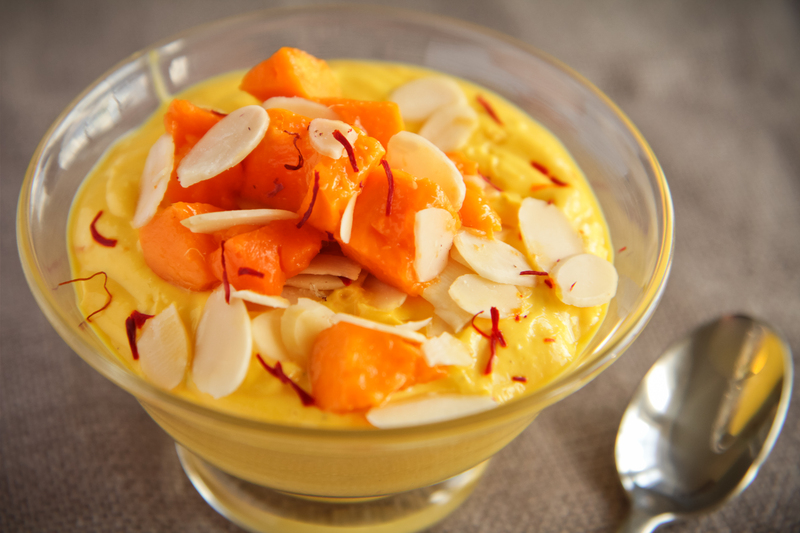 In a small saucepan gently re-heat the milk with the saffron, cardamom and sugar. When the sugar has dissolved whisk this mixture into the strained yoghurt followed by the rosewater. Divide the Shrikhand between four dishes and chill for at least 4 hours. Serve topped with toasted flaked almonds and mango slices. Saffron threads are the red/orange 3 branched styles of the crocus, grown from the Mediterranean to the mountains of Kashmir. Saffron has to be picked by hand making it the most expensive spice in the World, it colours food a brilliant gold, is very aromatic, verging on the medicinal and should be used sparingly. Make sure you buy the threads, usually sold in tiny clear plastic boxes. The saffron powder is often not pure.